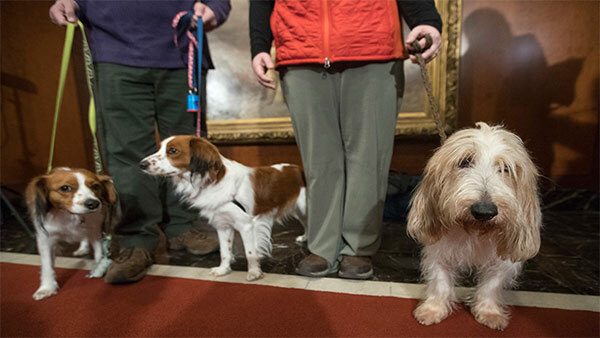 NEW YORK -- A spirited Dutch duck-luring dog and a friendly French rabbit hound are now running with the American Kennel Club's pack. The Nederlandse kooikerhondje (pronounced NAY'-dehr-lahn-seh KOY'-kehr-hahnd-jeh) goes back hundreds of years in Holland. The smallish, brown-and-white, spaniel-style dogs can be seen in some Dutch Old Master paintings. Her husband, Jac Knoop, is the president of the Kooikerhondje Club of the USA . The grand basset griffon Vendeen (pronounced grahnd bah-SAY' grihf-FAHN' vahn-DAY'-ahn) goes by "GBGV" for short. It's one of a number of long, low-to-the-ground basset breeds with centuries-long roots in Europe. A smaller cousin, the petit basset griffon Vendeen, and the long-eared basset hound have been recognized by the AKC for decades.